This was a staple appetizer at all our gatherings. Everyone loved it and always thought it was a more complicated recipe than it was. Mom always kept mum on that point and allowed them to think it was a culinary creation. Drain a small can of minced clams. Mix clams into 1 pint of sour cream. Add a few dashes of Worcestershire sauce. Resist the urge to add anything else. Chill for several hours. 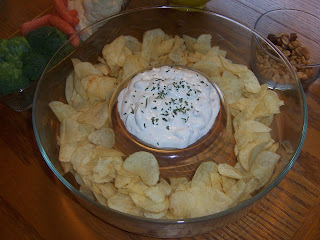 When time to serve, put in dip bowl in the center of a platter of regular chips (Wise potato chips would be most authentic). Sprinkle dip with a little dried parsley for color.